Greg Downey is an Evjue-Bascom Professor in both the School of Journalism and Mass Communication (where he served as Director from 2009-2014) and the School of Library and Information Studies at the University of Wisconsin-Madison. He enjoys a joint departmental appointment with Geography and an affiliate appointment with History of Science, and is active in the Holtz Center for Science and Technology Studies and the Center for the History of Print and Digital Culture. Downey is also the founding Director of the Internships in the Liberal Arts and Sciences program. His research uses historical and geographical methods to uncover and analyze “information labor” over time and space. In addition to numerous articles and book chapters, Downey is the author Telegraph Messenger Boys: Labor, Technology, and Geography 1850-1950 (2002), Closed Captioning: Subtitling, Stenography, and the Digital Convergence of Text with Television (2008), and Technology and Communication in American History (2011). He is also co-editor of Uncovering Labor in Information Revolutions, 1750-2000 (with Aad Blok, 2004) and Science in Print: Essays on the History of Science and the Culture of Print (with Rima Apple and Stephen Vaughn, 2012). His current work focuses on the “metadata labor” of library professionals, data-driven journalists, and academic researchers. Professor Downey’s teaching accomplishments include revamping the 350-student Comm-B course Introduction to Mass Communication (a gateway for entry into the Journalism & Mass Communication major) and pioneering the 150-student hybrid online and in-person Comm-B course The Information Society (a gateway for entry into the new Digital Studies Undergraduate Certificate). He has taught nearly a dozen different seminars at UW-Madison, such as History of American Librarianship, Video Games and Mass Communication, Uncovering Information Labor, and Interdisciplinarity in the Modern Research University. Downey has been a committee adviser to over four dozen doctoral students over the last decade. In 2007 he won the UW-Madison William H. Kiekhofer Distinguished Teaching Award. A former computer systems analyst, Downey has worked for Leo Burnett Advertising (1989-1992) and the Institute for Learning Sciences (1992-1995). 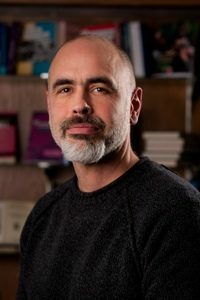 He earned his BS and MS in Computer Science from the University of Illinois at Urbana-Champaign in 1987 and 1989 respectively; his MA in Liberal Studies from Northwestern University in 1995; and his Ph.D. in history of technology and human geography from the Johns Hopkins University in 2000. Previous to coming to Madison in 2001, he spent a year as a Woodrow Wilson Postdoctoral Fellow in the Humanities at the University of Minnesota. Downey resides in Madison and enjoys bicycling to work every day, all year long.